1952 Panhead Tropical Green N.O.S. tanks and matching new finish fenders. 34 photos. 1940 Knucklehead extremely rough fender and sheetmetal repair to primer. 36 photos. 1940 Knucklehead fender and sheetmetal repair. 21 photos. Tech Column AMCA. Front fender repair. 7 photos. 1967 FLH Black and White. 7 photos. 1915 Henderson Blue kit bike. 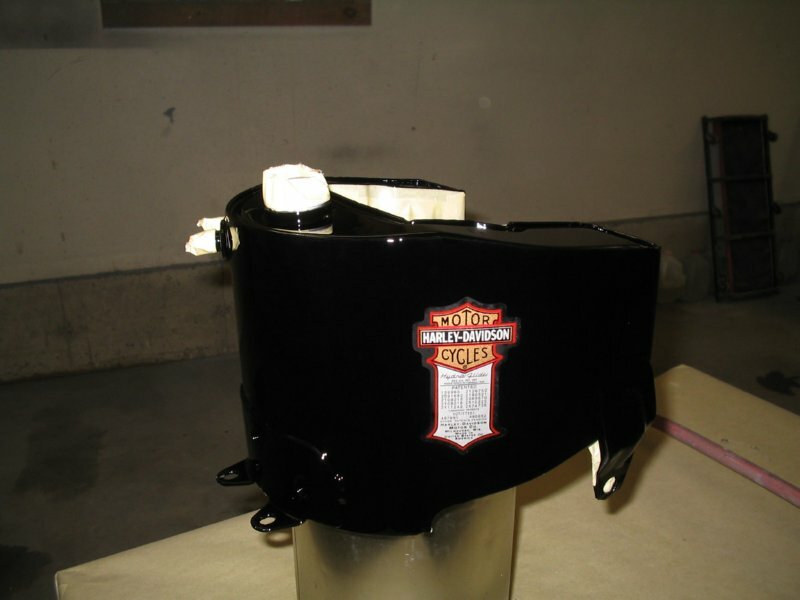 1936 EL Harley Davidson fender valance replacement, Fender brace repair, frame and oil tank. 93 photos. 1939 Oil Tank and Seat. 16 photos. Oil Tank Repair. 10 photos. 1940 EL Frame. 3 photos. 1954 Panhead Frame. 28 photos. Man finds birthyear bike in Altoona Pennsylvania! - 1954 Panhead golden annniversary model. 69 photos. 1947-1950 gas tank emblem paint method. 8 photos. 1936-1948 fender straightening and riviting procedures. 45 photos. 1957 Panhead sheetmetal repair and refinish Midnight Blue. 33 photos. 1959 duo-glide sheetmetal Strip and repair Hi-Fi Turquoise. 43 photos. 1927 Indian Chief in pre-war red. 11 photos. 1948 U custom license plate bracket and dual exhaust. 6 photos. 1965 FLH Hi Fi Blue and White step by step guide. 12 photos. 1970 Boattail Sportster Hi Fi Blue. 9 photos. 1950 Indian White fender straightening and refinish. 19 photos. 1973 Corvette frame off restoration. 77 photos. Old Ford businessmans coupe. 16 photos. 1957 FLH Gas Tank Original paint repair work. 2 photos. 30s KJ Henderson Maroon and Cream. 3 photos. 1915 Henderson Blue kit bike. 2 photos.